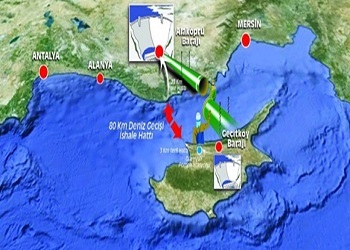 That water transfer project that foresees water being transfer from Turkey via underwater pipelines to the Turkish Republic of Northern Cyprus and is being referred to as the project of the century is nearing completion. The Minister for Environment and Natural Resources Hamit Bakırcı spoke to BRT about the project and said that the sea phase of the project was about to be completed and the land phase of the project in the TRNC will be completed in December this year. Evaluating the project Bakırcı said that everything was progressing well and that the water will arrive on the island in December. ‘By the end of 2015 the water will reach homes throughout all of the Turkish Republic of Northern Cyprus’ said the Minister and added that for now the majority of the land phase of the pipe installation from Güzelyurt to Lefkoşa had been completed. ‘Once this is finished we will move on to the pipe installation from Girne to Tatlısu and then Gazimağusa to İskele’ said Bakırcı and added that the committees who will oversee the distribution of the water were continuing with their workings. Explaining that the law regulating how the water is going to be administered had also been prepared and would be presented to the parliament as soon as possible Mr. Bakırcı said ‘we as the state want to manage the water but technically we do not have a fully equipped department’. He noted that although the water is coming to the country for free there will be a price to pay as 25 megawatts of energy is needed to pump and distribute the water. ‘We are still working on how much the water will cost the people’ said the Minister. Meanwhile referring to the AKSA power plant that has been operating without a filter for years and ruining the environment, Mr. Bakırcı said that AKSA will be fitting a regulator on its chimneys within 15 days and by December it will be in service with a fully equipped filter. I refer Mr. Bakirci to my suggestion about storing water in the existing natural small lakes on the south side of the Kyrene mountains in the winter when water is plentiful. I suggested this to many people like an MP at the time Aslanbaba, Huseyin Gokce Bey, Ata Atun Bey. Recently I studied the lakes on Google again and put photos of all 13 lakes on my Facebook page. Of course the idea needs to be investigated. These lakes are high up, some around 180m and some around 100m. If we fill them up in the winter they can supply the underground reserves and use the water in the summer. I worked on a similar project in Southwest of England where the water shortage in the summer has now been resolved some 15 years ago. Of course you would need a feasibility study etc. and would need a lot of work on the lake beds and perimeters etc. you could also link some of them together as some are at similar levels and near each other etc. An other project I worked on in East Anglia was to pump water into an underground reservoir in the winter again and extract it and use it in the summer. having looked at the reservoirs in North Cyprus this is also possible and it would save some water on evaporation loss also. Also what about building water reservoirs high on the south side of the Kyrene mountains for storing the water when it is plentiful in the winter. If we can not store the water there will be problems again when everybody needs the water at the same time. MANAGMENT is the key otherwise the available 75 m cubic meters does not mean anything. Ralph Bey, ( Dear Ralph ) Yes you can mention it on your website. When the project was announced 3-4-5 years ago by Recep Tayyip Erdogan and his government, that is when I wondered and studied the lakes in question on Google and looked at the topography and positions and thought it was a good idea to use these lakes. In the simplest form, they could easily be topped up by the possible pipe line that will take water from Lefkosa area to Iskele. Obviously pumping will cost but must be worth it. A pipe nine running at the same level as the higher lakes along the south side of the Kyrene mountains can cheaply supply and keep these lakes top up. I also studied the aquifers. I sent the info to a few people at the time and again recently but no reply. Thank you for your courtesy and reply. I can send you the maps etc all in order starting from the main lake Gecitkoy Baraji all the way to Sinirustu Goleti near Iskele. Also the underground aquifers map if you wish. Lets see if anybody says anything. We may be wrong and these options may have been explored and are in hand or somebody thought they are not worth it. I do not know!! I wonder if we can get oversees i.e. EU funding to carry out a feasibility study on this. I can lead it. Osman Bey, thanks for your answer! Please send me the maps and some background information about your person (best including an actual picture). I will then summarize your information to an article and publish it on our websites and different Facebook-groups related to North Cyprus. Let´s see if some reactions will come from the government! The email address to send your info to is tfrnorthcyprus@gmail.com. We could even build small turbines when we run down the water from the high up lakes and reservoirs and create our own electricity.